To develop its own products, every manufacturing company follows its own set of rules. Products are manufactured using raw materials, outsourced components and equipment. Different products often have different level of quality. For several reasons, sometimes there may be a few defective products among perfectly functioning ones. When the level of defective products shipped to customers is too high, there can be a severe negative impact on brand image and reputation. This in turn can reduce future sales. It is therefore in the best interest of the manufacturer to pay close attention to the number of defective products that are manufactured. 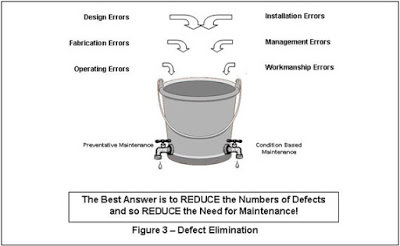 There are several ways to reduce defects. These strategies can be divided into early stage strategies and late stage strategies. Early stage strategies are focused on removing defects before the manufacturing process starts. Late stage strategies generally involve using scientific methods to reduce manufacturing defects during the process of production. Product Design: Sometimes poor product design can result in product defects. It is useful to involve manufacturing engineers as closely as possible from the start as they can forecast the potential areas of concern right at the preliminary stage of development. The manufacturing experience that these manufacturing/production engineers have can prove to be invaluable to the development team and can save the company a lot of time and money. Involving an interdisciplinary team of engineers during the product development process is one way to reduce future manufacturing defects. Flexibility in Production Process:Having the right amount of flexibility in the process of production can be one of the ways to reduce defects. An innovation approach to production can be helpful and refreshing for the company. For example, identifying what parts of production should be outsourced vs. done internally. Sometimes a new manufacturing process is necessary to determine product quality and decrease defects. Use of Technology (Smart Manufacturing):Major manufacturing companies are using computer modelling or simulations or other IT services to detect product defects and handle them in the early stages of the production process. Using technology like this can offer a real life test of real world production scenarios and help to identify problems early. Take Preventive Measures:Taking preventative actions such as replacing obsolete equipment and machines that always require repairing or servicing can prove to be a smart manufacturing move. Making sure that all operating machinery is functioning perfectly is also a good cautionary step. Inspection: Companies should inspect the manufacturing process regularly to identify the root cause of defects. Technologies like ultrasonic technology, particle testing, vibration and resistance testing in order to reduce defects in the production process are available easily these days and should be used. Maintain Strict Quality Control:Innovation in product design is rendered futile when the production line is not checked on regularly. You can place a quality control team in place which can be made responsible for ensuring that production follows strict rules at every stage. A quality control team can use Six Sigma methodology to reduce product defects and ensure better quality. Communication Flow: A big strength of any well meaning and well functioning company is communication. Regular communication between production employees and other product design staff and engineers is essential and helps in identifying and solving problems quickly. This teamwork can help bring about greater efficiency and can substantially reduce defects. A cross disciplinary development team and a well monitored production line form the foundation of any production process. If the base is solid, the entire foundation of your production would be rock solid. Swiftly identifying the root cause of defective products, organizing a team around them and developing strategies solve issues and improve performance can take your manufacturing companies to reach greater heights. Tools like Six Sigma, ISO 9000, Total Quality Management and the 5 ‘S’ Methodology are some of the most powerful and effective tools available in the market that manufacturers can use to reduce defects in their production process. SolutionBuggy is an exclusive and dedicated platform for the Manufacturing Sector in India. It seamlessly bridges the gap between the industrial sector and professionals for on-demand consultation and services including projects. It connects SMEs and Large Scaled Industries with Industrial Consultants / Experts and Industrial Product Suppliers over the internet for collaboration and success. It is an integrated platform wherein industries can share their issues/ problems and post requirements; consultants/ experts can showcase their capabilities and offer services and solutions and suppliers can list their products to match the industry requirements.